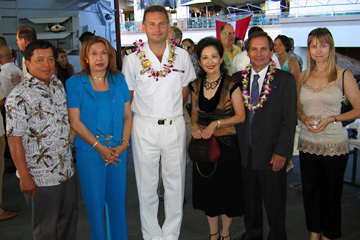 FOREIGN AFFAIRS: Capitaine de frégate Alexis Latty, third from left, was the gracious host of a diplomatic reception aboard the French frégate de surveillance Prairial in Honolulu Harbor Tuesday. Hawaii-based military personnel, members of the local diplomatic corps and prominent figures in the expatriate French community enjoyed several hours of French hors d'oeuvres, miniature pastries and champagne. Diplomats in attendance included Philippine Consul General Ariel Y. Abadilla, left, Honorary Chilean Consul Gladys Vernoy, Honorary French Consul Patricia Y. Lee and French Deputy Consul General Olivier Arribe. Professional translator Emilia Cazin joined them for the photo op. HAPPY BIRTHDAY, JEFF (Part 1): Hawaii film producer Jeff Katts celebrated his birthday with an intimate early evening party for a few close friends and colleagues at the O Lounge on Wednesday. 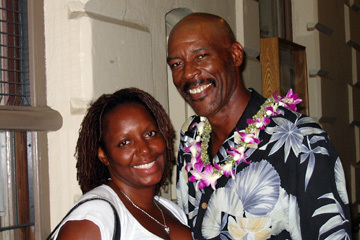 Honolulu actress Michelle Reynolds was fashionably on time in wishing Katts a happy birthday. HAPPY BIRTHDAY, JEFF (PART 2): Jeff Katts talked film industry business with Aubrie Allen, left, and Sharon Vélez Erickson as he celebrated at the O Lounge on Wednesday. Katts' next indie film, "The Hidden Battle," opens at the Regal Cinema on Sept. 20. HERE'S TO GOOD JAZZ AND GOOD TEQUILA! : Neiman Marcus makeup specialists Laura Camaetto, left, Devonnee Kira, Shelly Bukes and Carmen Morioka toasted the performance of jazz vocalist Sandi Tsukiyama de Oliveira during "Jazz Night" at the O Lounge Wednesday. Camaetto, Bukes and Morioka are NM makeup consultants; Kira, a sales associate. HELLO, GOOD BYE: Doreen L. Thompson gave Jim Andrews two thumbs up after his opening night performance in "Yohen" at Kumu Kahua May 28. Thompson and Andrews were a great couple in "Joe Turner ..." at the Actors Group earlier this year, but she's moving to California this summer.